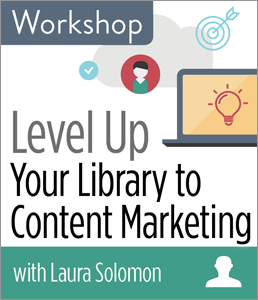 CHICAGO—ALA Publishing eLearning Solutions announces a new session of our popular workshop, Level Up Your Library to Content Marketing with Laura Solomon. This workshop will last 60 minutes and take place at 3:00pm Eastern/2:00pm Central/1:00pm Mountain/12:00pm Pacific on Wednesday, Jan. 17, 2018. Has your library just been "doing social media?" Have you seen mixed results? One way to be more effective online is by moving beyond the promotional mindset of traditional marketing and by embracing a different way of creating content that will engage and help serve the needs of your community. Are you ready to make your library’s online efforts more effective? Welcome to content marketing. Content marketing may be a new term for librarians, but it is a growing and effective trend in the business world. In this workshop, Laura Solomon introduces you to the nitty-gritty of content marketing by teaching you how to create a content strategy and how to implement it. This workshop explains this growing trend, as well as gives you and your staff the tools they need to get started on creating your own content strategy. Laura Solomon, MCIW, MLS, is the Library Services Manager for the Ohio Public Library Information Network. She has been doing web development and design for twenty years, in both public libraries and as an independent consultant. She specializes in developing with Drupal. She is a 2010 Library Journal Mover & Shaker. She’s written three books about social media and content marketing, specifically for libraries, and speaks nationally on both these and technology-related topics. As a former children’s librarian, she enjoys bringing the “fun of technology” to audiences and in giving libraries the tools they need to better serve the virtual customer.